The series Between Red is at first glance overwhelmingly simple. 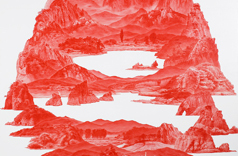 A series of landscape paintings is rendered in delicate washes of red. Large swaths of unmarked white meander between islands of crimson land. The blank spaces are harshly set against the carefully detailed fragments in red; nonetheless, they cohere into the flawless totality that is created by each painting. The fragmentation behind the landscape’s seeming totality is operating at the core of Sea Hyun Lee’s paintings. It is due to that fragmentation that these seemingly simple landscapes are able to evoke multiple dualities, a vast landslide of inconsistencies and fissures. This fundamental gesture of splitting, alongside its contrasting totality, is the uncanny tension that animates Lee’s paintings, and that makes them compelling both on a conceptual and a purely aesthetic level. 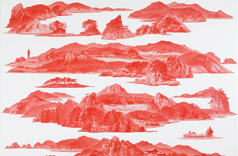 Despite their distinctly political engagement - the paintings combine elements of both the North and South Korean mountains, and employ the deeply symbolic color of red - Lee’s paintings are unlikely to strike the viewer as either political statements or aesthetic calculations. And indeed, they are neither and not even simply both. 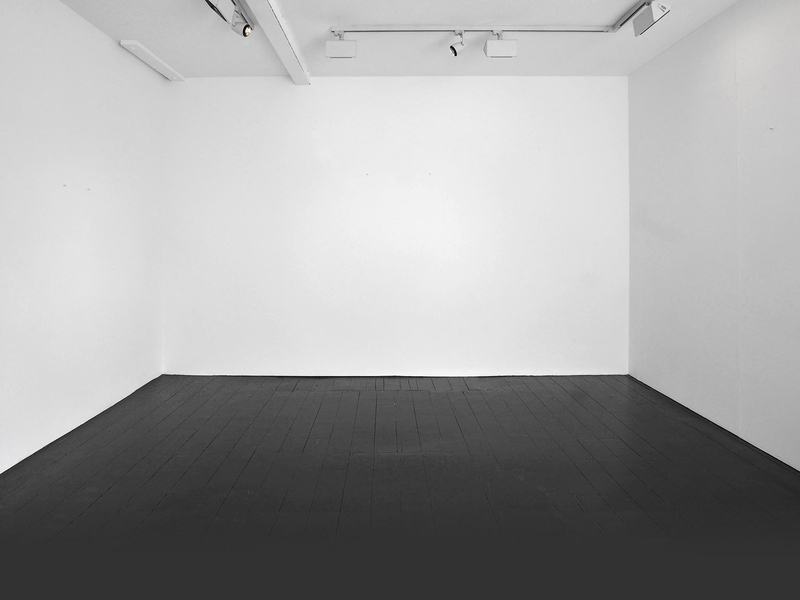 They are primarily deeply personal works that reference Lee’s own sense of the past and its losses. Here, Lee tarries with two familiar ideas: nostalgia and utopia. But he avoids approaching either with mere simplicity or mere skepticism. Instead, his paintings are infused with a sophisticated sense of nostalgia, and a wry idea of utopia. Lee is of course concerned with vanishings; these are paintings of a lost past, of disappearing landscapes and eroding memories. “The landscape no longer exists, and so I have to paint it,” Lee explains. But his paintings are never simply about the longing to recover the past. They are, instead, about the very process of reconstitution itself. They are concerned with a trauma that is not necessarily located in the past, but that is perhaps instead located in the endless attempt to recapitulate the past. Lee’s work captures the manner in which we constitute our own ontological experience, and in particular our sense of the past - alternating between moments of perceived totality, and moments where various cracks appear to rupture that constructed sense of the world. Individually, but particularly as a body of work, Lee’s paintings inhabit a curious space between wholeness and fragmentation. In this way they reveal both the disruptions and inconsistencies that mar our sense of reality, as well as the totality we evoke in order to keep that disorder at bay. This is where the emotional power of Lee’s paintings resides - in their depiction of trauma, but also in their depiction of the devices we use to refute the fact and the evidence of that trauma. The human compulsion towards narratives of wholeness and totality is rendered with an acute awareness of its futility, as well as its potential to achieve a kind of grace. Lee represents both the landscape of fragmentation and the restored landscape of completion in equal measure.